Who says camping is for boys? This pink camo camp party had all the element required to rough it in the great outdoors…in style. 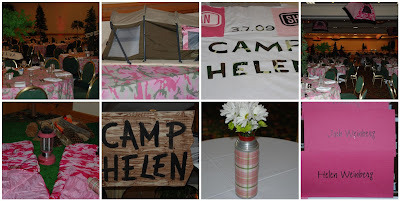 Camp Helen featured pink tents, pink camo and pink sleeping bags. The placecards were hersey bars…make that HELEN’s bars. Assorted trees served as centerpieces so that when you looked across the room you felt like you were in a forest. Table assignments were various camp activities…hiking, swimming, arts & crafts etc. GO (camping)Pink! This entry was posted in Camp Theme Bat Mitzvah, Camp Theme Party, Glamping Party, Pink Camo Party on March 8, 2009 by Setting the Mood.